The latest fashion color trends are anything but boring. Ranging in hues from shades that offer a subtle hint of spice to those that have soft whispers of muted tones, there are colors for any woman's style. Whether she wants to go classic and polished with a simple color during the day or pump up her look with a bold color for edge, the endless color trends give a fashionista many fabulous choices. Gone are the days of dark autumnal tones. The latest colors are full of versatility and depth in tone. Traditional fall colors have been lightly muted down for a fresh new look. Here are some of the hottest colors that need to be on your radar as deemed by some of the top color forecasting companies, celebrity style spottings, and the runways. A little flavor has never hurt a wardrobe. For an unexpected pop of zest, dark yellow is the way to go. Think sunshine yellow, turned down a bit with boldness. The color trend has an optimistic undertone and brightens up fall outfits with a bit of unexpected flair. When First Lady Michelle Obama wore a yellow dress by designer Narciso Rodriguez for the State of The Union Address, her dress sold out before the completion of the President's speech, as reported by Inside Edition. If you loved the pastel blue color trend from sumer, then you will absolutely enjoy wearing this soft, rich shade of blue. The new blue color is serene and soft. According to a fall color report featured on Refinery 29, Leatrice Eiseman, executive director of the Pantone Color Institute, stated that comforting blues are trending due to the reassurance that people are searching for in today's culture. Think purple, with a touch of pink, and you have one flawless color. The name is flirtatious and perfect for the color which is a light, yet lively tone. If pastel pink is too girly for you, lavender rose might prove to be the right fit. It is stronger while still expressing a feminine touch. As stated on Stylecaster, the color yellow was combined with pink several times on the runways and became a color combination that offers a unique pairing for your autumn look. In another color trend, green gets a gorgeous makeover. This trendy green color is reminiscent of natural green botanical hues, with a touch of luxurious sophistication that is similar to emerald green, but lighter. Hinting at the freshness of nature, luscious green is a color many women are embracing. This shade of green is anything but boring. 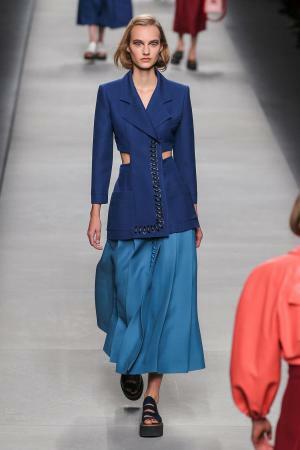 Fashion houses such as Iceberg, Tory Burch, Martin Grant, Roland Mouret and Monique Lhuillier incorporated this shade in their collections to according to a Fashioners' Color Report. The street-chic leather dresses and outfits in this shade by designer Barbara Bui stood out on the runways for their originality and unique looks. Whether you choose to accessorize with this color, or incorporate with a bold dress, it's a hot color to try out. Fall wouldn't be complete without a warm toasty color, and that's exactly where taupe enters the scenario. Thanks to its versatile camel-toned brown shade, taupe is a trendy color that is an excellent color as a base, and will remain a classic for years to come. Actress Angeline Jolie was spotted carrying a Saint Laurent bag in the classic color with a black dress, proving that Camel Taupe is versatile color, as shown on Daily Mail. One of the strongest colors making a fashion statement is a deep tomato red. This new shade of red is a subtle blend of crimson-mixed burgundy with a touch of bright red. The color trend is packed with a power and vibrancy that demands attention. Inspirational hints of red have been trending on celebs such as Penelope Cruz, as spotted on In Style. For the last few seasons, gray has been trying to make its way onto the fashion color scene. The latest gray trend has a metallic touch. The new color is timeless, can be paired with anything, and has a sense of sophistication making it a suitable color any time of day. The color is ideal for when you want to wear a color that is dark, but not as abrasive as black. 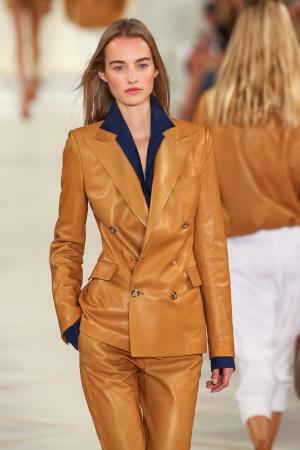 Examples of the color have trended on the runways of designers such as Michael Kors, Jason Wu and Christopher Kane. It is typical to see a fall color palette that includes orange. The latest orange color takes on a different look as a warm and rustic hue. Glamour has cited the new rustic orange as not only a color that was popular on the runway, but also one that complements several skin tones. Its surprising versatility allows it to be beautifully paired with other seasonal colors such as blue and gray, making it one of the most wearable trends. When it comes to embracing new colors for one's wardrobe, the idea may present a challenge. There are several ways that trendy new hues can be mixed with other colors or worn monochromatically. In case you are feeling stuck, here are a few color pairing ideas to consider. Tone-on-Tone: One way to create a unique look with the new colors is to blend a few shades of one color. Wearing colors in this manner allows you to appear modern and understated. Mix in Prints: In addition to a full range of hot colors that are trending for fall, new prints have been presented on the runway. The round up of hues can be paired with new prints to create an outfit that is full of personality. Color Mixing: Getting dressed is about having fun and expressing your personality. What better way to demonstrate both than to coordinate a few vibrant color pairings. Three that you might want to consider are: Dark Yellow with Luscious Green, Lavender Rose with Deep Tomato Red, and Dark Powder Blue with Camel Taupe. Color selection is one part of the equation of fashion design when a collection is created for the runway. When it comes to narrowing down the colors that are perceived to be the trends for the coming season, however, the runway is no longer the main source of inspiration. After all, designers are inspired by what is going on around them, which they translate into gorgeous creations. Jackie Jordan, a director of color marketing for Sherwin-Williams, was quoted in an article in STIR in regard to the color forecasting industry as saying: "We study information from many resources, such as current and predicted economic conditions, travel destinations, cinema, theater, trade shows, and various trend-watching organizations, websites and blogs." Within the fashion industry, designers lean on several color and trend forecasting agencies to create their seasonal creations. Top color forecasting agencies include Pantone, Trendstop, Color Marketing Group, and Design Options, Inc. Many color trend companies begin the work of forecasting trends years in advance. The color trends, according to color expert and Color Association of the United States leader Roseanna Roberts, are rooted in "as many permanent facts as we can," while focusing on future events and trying to predict where the attention will be focused. By incorporating a few on-trend color selections, it's easy to make your wardrobe come alive and match the season. The latest trends offer colors that can harmoniously bring any outfit look together in a new way. You can create a unique sense of expression by wearing colors you've never tried before. Freshen up your look by selecting a few color selections that you like best and use them with items already in your closet to create trendy outfits that have your own original style stamp.